Halogens are elements in Group 17 of the Periodic Table of Elements. They are fluorine, chlorine, bromine, iodine, astatine. The ions of halogen are called halide. The halogen which is at a higher position in group 17 ( more electronegative and reactive) can displace a halogen that is below it (less electronegative and less reactive) from its solution of halide ions. transfer of electrons from the halide ions which are positioned further down in group 17 to halogens which are positioned further up occurs. Halogens which are positioned further up in group 17 act as oxidation agents. These halogens undergo reduction and are reduced to halide ions. The halide ions which are positioned further down in group 17 act as reducing agents. These ions undergo oxidation and are oxidised to halogens. Reaction between Chlorine water and Potassium Bromide solution. 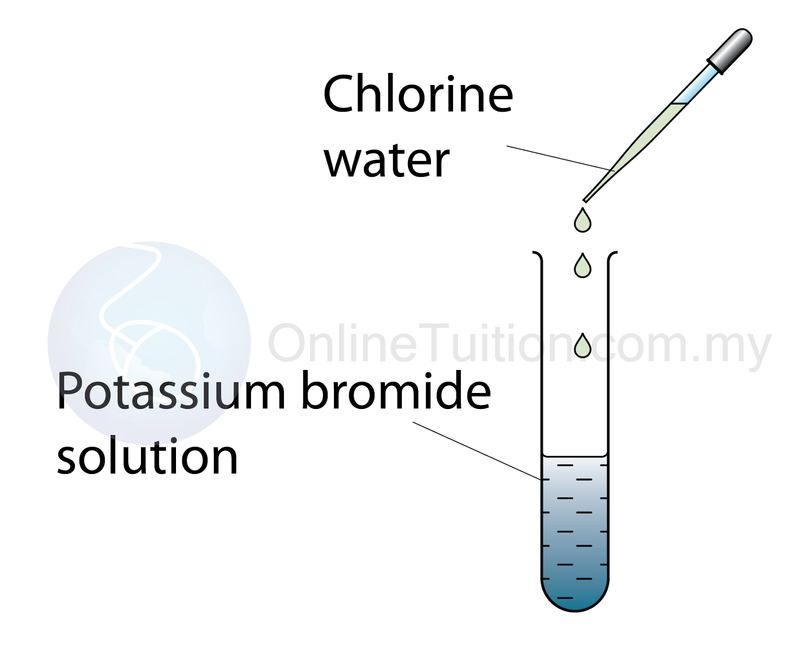 A few drops of chlorine water are added to 2 cm³ of potassium bromide solution. 2 cm³ of tetrachloromethane is then added into the mixture and shaken. The colour of the tetrachloromethane (the lower layer) is recorded. The colourless tetrachloromethane turn brown. This indicates that bromine is presence in the solution. Chlorine is more electronegative than bromine. In the reaction, chlorine molecules displaced bromide ions in the solution. Bromide ion is oxidised by releasing electrons to become bromine. Chlorine molecule is reduced by receiving electrons from bromide ion. If halogen or halide ions are involved, usually a confirmatory test is required to testify the presence of the halogen or halides. The tetrachloromethane can be used in the halogen confirmatory test. This can be done by shaking the aqueous halogen solution in a little tetrachloromethane. Two layer; are formed. Tetrachloromethane which is denser forms a layer below while the aqueous solution forms a layer on top. So, the halogen present can be confirmed by the colour of the halogen in tetrachloromethane. The identity of chlorine, bromine and iodine cannot be confirmed through the colour of its aqueous solution because its colour changes depending on its concentration. Halide solutions in water are colourless. For example, solution of NaCl, NaBr, NaI, KCl, KBr and KI are colourless.